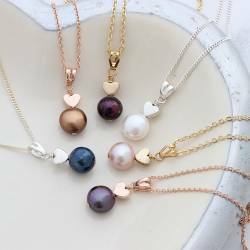 Available with white, pink, peach, peacock and black cultured freshwater pearls. Great for any occasion, these pearl studs make simple and elegant earrings for your bridesmaids, gifts to your loved ones or as a timeless addition to your jewellery collection. Freshwater pearls and sterling silver.